I Love You More Than Carrots: Unofficially Official Updates and Thirteen Months! Unofficially Official Updates and Thirteen Months! After Carter turned a year old, I pretty much gave up on his monthly updates. Heck, I'm pretty sure I only updated what he's been up to since then a mere two or three times on this blog but ever since he's started conversationally talking, I've been meaning to write more. Because he's so funny and so awesome and just such a ham. And they say that second children tend to get the shaft? Ha. Anyway, I misplaced Maclane's monthly stickers somewhere around month six and after tearing the house apart for months on end, I eventually gave up search and came to terms with the fact that only half of his first year would be documented wearing said adorable stickers. Believe me, that was something that gave this self-admitted Type-A mom the cold sweats and still does if I think about it long enough. And then our trip to New Orleans came and it was time to pack our bags. Lo and behold, the stickers were shoved deep down inside one of the front pockets of the suitcase, which I swear I had previously checked, of course, and I had a major face to palm moment when I found them. 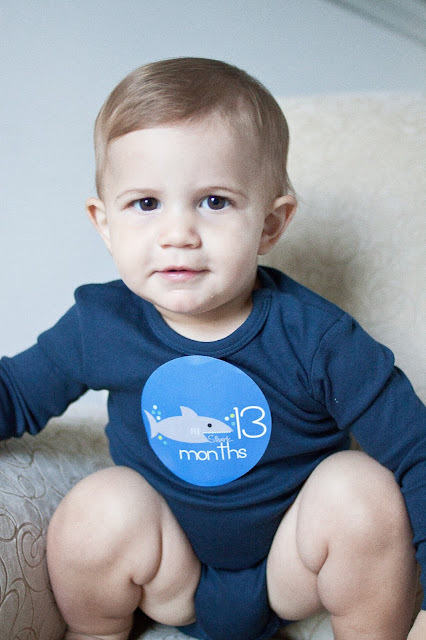 Luckily, Month 12 made an appearance in the monthly photo book and it was then that I realized I had a whole other set of stickers for his second year. I couldn't let them go to waste, now could I? *we'll see the doctor for your 1yr appointment in August when Carter goes for his 3yr. Loving: Carter, Sheepie, the beach and playing with cars and trucks. Saying: "Hi!" (first word) "Up, up, up!" "Dog" "Dada" "Mama"
Eating: Everything except crab meat and avocados. Learning: To travel backwards down stairs and to drink (and enjoy) milk from a sippy or straw cup. Still: Nursing 4-5x throughout the day, waking up once over night around 3am and after waking, sleeping in our bed. You are sweet, happy and so very mellow. You are charming and funny and you go with the flow but can turn feisty on a dime. You do not like to share and you always want what your brother has. Thankfully, he's much better at sharing than you are. You are silly and loving. Sneaky and fearless and it has been nothing short of an adventure watching you grow and develop your own unique personality. It's amazing how you are truly everything we never knew our family of three was missing. Nicknames: MacAttack, Mackie, MacADoodle, Meatball. He is the cutest. Ugh. I want to squish! He's SO cute AP! And my 2nd, Connor, was/is, shorter and heavier than my first. It's so weird/funny to see two boys built so differently. Now at 2.5 and 4, they practically share the same clothes. Perhaps I should just make a communal closet for them to use. haha! 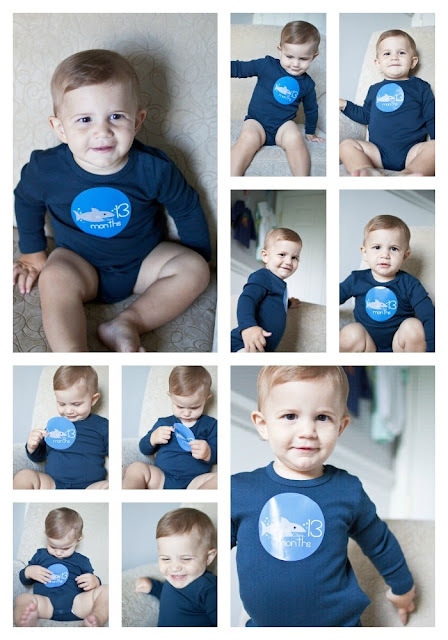 Oh MY WORD>.. he is adorbs... and how the heck did he get so big so fast? Wow, he is still nursing a lot. That's great, probably why he's so "husky". He says a lot of words too. Gunner pretty much only grunts or squeals. Gah, I seriously can't get over how incredibly cute he is!!! meatball...i love it! And size 5 diapers?! Stop growing up so fast!! He is SOOO so cute! Sweet pea!!! And I can't believe he doesn't like avocados!! They are God's gift to taste buds.